Hundreds of students of the Polytechnic Ibadan Thursday morning barricaded the main entrance and other gates leading to the institution in protest against the stabbed of one of their colleagues. Another student of the instutution was also reported injured. The victims got injured after a football match between the Faculty of Engineering (FENG) Queens and their counterparts from the Faculty of Business and Communication Studies (FBCS) which was held at the Sports Pavilion North Campus of the school. 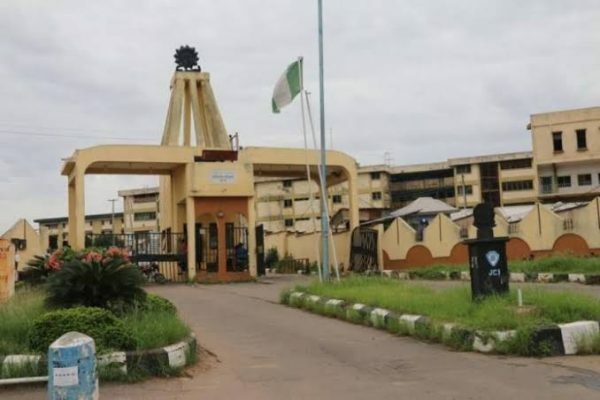 Toni Oyeniyi who is the Sports Director of the National Association of Engineering Students was stabbed in the head while the other student was brutally beaten after Faculty of Engineering lost to Business and Communication Studies. Our correspomdent reports that the students in protest against the violence carried various placards bearing various solidarity songs. An eye witness who is an HND Engineering student in the school stated that "Oyeniyi’s shirt drenching of his blood". The source narrated that "The awful scenario began with the culprits intimidating the FENG QUEENS TEAM after the match, and as the sport director and head coach of the faculty team, he had to come to the rescue of his players. He said during the match, despite that his faculty was losing with two goals to nil, they were still joking around and maintaining a mutual rapport with the opposite team from FBCS. But then, the culprits started with the throwing of sachet water into our midst to erupt violence, but "we still maintained our calmness." "But after the match, they came harassing the females and that was where some students from engineering interceded. The other student, whose whereabout is still unknown, was beaten brutally. "Oyeniyi was stabbed in the head in the process. One senator came to his rescue and that was when he was rushed to the Medical Centre for treatment". He added, "I didn’t see the need why FBCS would attack them because they won already, and that the perpetrator of the heinous act were not the opposite team from the FBCS following the chants they made after perpetrating it". Public Relations Officer of the Polytechnic, Alhaji Soladoye Adewole confirmed the incident but explained that, "They did not protest. They did not protest against the school. "They had a football match yesterday and resulted into fracas. "It is an in fight between them. "And the school authority has taken the necessary actions. They are not protesting against the school".